Kennard “Dewey” Ray passed away peacefully at the age of 87 on Saturday, June 23, 2018, surrounded by his loving family. He passed away after suffering a major heart attack. Dewey was raised on a family farm in Mesa, Arizona and graduated from Mesa High School in 1949. 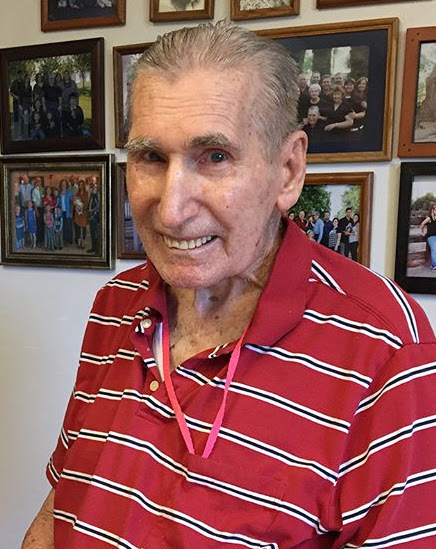 After completing high school, he served a mission for The Church of Jesus Christ of Latter-day Saints in the Northern Western States Mission (Washington and Oregon) from 1951 to 1953. Dewey married Ina Scott in the LDS Mesa Temple in 1953 and was also drafted into the Korean War in April of that same year. He served for two years in Ft. Lewis, Washington and was honorably discharged in January of 1955. Dewey graduated from Arizona State College at Tempe (Arizona State University) with a Bachelor of Arts Degree in Education in 1958. He was a police officer for the City of Mesa for 13 years and achieved the rank of Sergeant. He also taught Criminal Justice classes at Mesa Community College and owned a landscaping business for many years. Dewey retired at the age of 65 from The Church of Jesus Christ of Latter-day Saints, as a facilities maintenance worker. Dewey was best known as a loving husband and father. A few months before his passing, he celebrated his 65th wedding anniversary to Ina Scott Ray. Dewey and his wife, Ina, had eleven children; Ina “Lynn” (1954-2015), Dewey, Scott, Dianne, Donald, Michelle, Annette, Steven, Amy Jo, Rebecca, and David. Dewey is also survived by 41 grandchildren and 39 great-grandchildren. Dewey was an avid basketball player, enjoyed gardening, and loved to play card games and board games with his family. A visitation for Dewey will be held on Wednesday, June 27, 2018 from 6:00 to 8:00pm at 2228 E Brown Rd, Mesa, AZ 85213. There will also be a graveside service at the City of Mesa Cemetery located at 1212 N Center St, Mesa, AZ 85201 at 9:00am on June 28, 2018. Family and friends are welcome to attend. Thinking of you Ina. You and your family are in my prayers. Thanks for all your love, devotion, service, etc. to the family. I attended your wedding reception so many years ago!!!! My love and prayers to all the family. Becca been thinking about you bunches and sending hugs your way. Ina and family, hard to loose someone so loved! Our prayers and thoughts are with you. What a legacy and incredibly life! My thoughts and prayers go to the family. Our thoughts, prayers and lotsa love are being sent your way, Aunt Ina and family! We forever hold so much love and admiration for you and your beautiful eternal family! Dewey showed his love for others through his life of service. It was a privilege to know him. Ina and family, we wish you peace at this time.